Spiritual Communion is a desiring union with Jesus Christ in the Holy Eucharist as a response to God's own desire for union. It is used by individuals who cannot receive Holy Communion. "O Jesus I turn toward the holy tabernacle where You live hidden for love of me. I love you, O my God. I cannot receive you in Holy Communion. Come nevertheless and visit me with Your grace. Come spiritually into my heart. Purify it. Sanctify it. Render it like unto Your own. Amen. Lord, I am not worthy that thou shouldst enter under my roof, but only say the word and my soul shall be healed." An indulgence of 500 days, if thrice repeated. Although a real communion is at the oftenest restrained to once a day, yet you are at liberty, as was said above, to communicate in spirit every hour; and nothing but your own negligence can prevent your receiving this great benefit. And it is worth observing, that a spiritual communion is sometimes of greater advantage to the soul, and more acceptable to God, than many sacramental communions performed with little preparation and affection. When, therefore, you are disposed to receive the Son of God spiritually, be sure he is ready to give himself thus to you for your food and nourishment. By way of preparation, turn your thoughts toward Jesus, and after a little reflection on the multitude of your sins, declare to him your sincere sorrow for them. Then beg of him with the most profound respect and lively faith, that he will condescend to enter your heart, and replenish it with a new grace, as a remedy against its weakness and the violence of its enemies. Every time you mortify any of your passions, or perform some act of virtue, take that opportunity of preparing your heart for the Son of God, who continually demands it of you; then for addressing yourself to him, beg, with great fervour, the blessing of his presence, as the physician of your soul, as a powerful protector to take and keep possession of your heart against all opponents. Call likewise to mind your last sacramental communion; and inflamed with the love of your Saviour, say to him: when shall I receive thee again, O my God? When will the happy day return? But if you desire to communicate, spiritually, with greater devotion, begin to prepare for it every night; and let every mortification and each act of virtue you practice, tend to prepare you for receiving, in spirit, your amiable Redeemer. In the morning when you awake, meditate on the great advantages accruing from a holy communion, in which the soul retrieves lost virtues, recovers her former purity, is rendered worthy to partake of the merits of the cross, and performs an action highly pleasing to the eternal Father, who desires that every one should enjoy this divine sacrament. From hence endeavour to excite in your soul an ardent desire of receiving him in compliance with his will; and with this disposition say: Lord, since I am not allowed to receive thee this day sacramentally, let thy goodness and almighty power so order it, that cleansed from the stain of sin, and healed of all my wounds, I may deserve to receive thee in spirit, now, each day and hour; to the end that being strengthened with new grace, I may courageously resist my enemies, especially that failing, against which, for the love of thee, I now wage war. 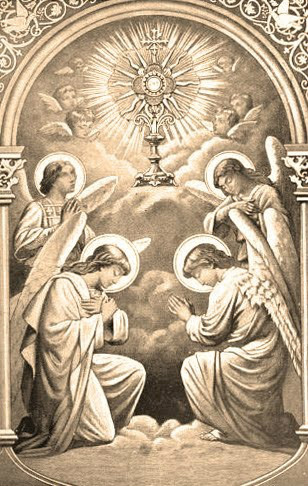 Blessed & praised be the most holy Sacrament of the Altar!